Is this what you want? Have you ever noticed these facts? Women’s magazines have extra ads and articles encouraging weight loss than men’s magazines. Over three-quarters of women’s magazines covers mention at least one message about how to transform a woman’s physical performance—by diet, exercise or cosmetic surgery. Television and movies emphasize the significance of a thin body as a measure of a woman’s value. Over three-quarters of the female characters in TV situation comedies are skinny. Only one in twenty is higher than average in size. Heavier actresses tend to accept negative comments from male characters about their bodies. But there’s also good news. Here are some movements to kick the trend. The Quebec magazine Coup de Pouce has integrated full-sized women in their fashion section constantly. Chatelaine has never used touch-up photos and young models who less than 25 years old. 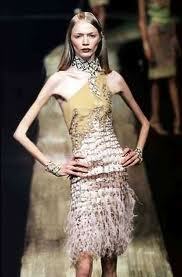 Madrid-one of the fashion capitals in the world- has banned ultra-thin models from the runway in 2006. Spain has held lately a project with the purpose to make clothing sizes standardization using a special process (a laser beam) that is used to measure real life women’s bodies. On the other hand, unfortunately, advertising set of laws in market place. In advertising, thin is potential and there’s still the conviction that only thin models can encourage the sales of beauty products. So, ladies, now it’s all up to you. Do you choose to be much influenced by women images that you see in media and become obsessed to thinness? Or you just see it as promotion tools. It’s not ‘real’ women. Just be happy and grateful with your current body size and live a healthy life. i want to be THIN, but not to make an impression that i might CAME FROM SOMALIA, haha. I guess, no matter thin or fat, what matters is that you are healthy. That's true! Women should learn that fat loss is much-much more important than weight loss. ugh that's too thin n bad,,, mmm i'm gonna think twice if obsessed with thin,, I love the way i am n enjoy anykind of foods..as long as not too much n stay healthy:) Met puasa Lina!